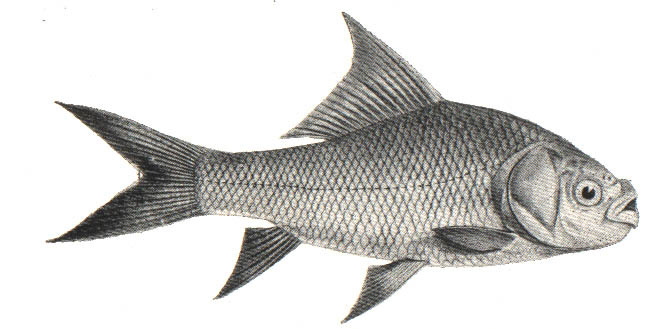 Distinctive characters : The Catla is distinguished from other genera of Carps by its broad head and its wide mouth with prominent lower jaw. The upper jaw has no lip ; the lower is moderately thick having a continuous free posterior margin. There is a moveable articulation at the juncture of the jaw bones. The gill-rakers, horny processes on the inside of the bony-supports to the gills, are long, fine and closely set. Length of head 4 1/2 to 4 3/4 : Height of body 3 to 3 1/2 in the total length. Diameter of eyes 6-7 in the total length of the head, 2 diameters from the end of the snout, and 3 apart. Scales. 40-43 along the lateral line. 5 1/2 - 6 1/2 rows between it and the ventral fin. Colour : Greyish above, becoming silvery on the sides and beneath. Fins dark coloured, in some specimens nearly black. The Catla attains a length of 6 feet and scales up to 100 lbs. in weight. It is a bulky fish.